Off view for many years, the over life-size bronze portrait of Tiberius from Herculaneum highlights the ongoing collaboration between the J. Paul Getty Museum and the Museo Archeologico Nazionale in Naples. At the J. Paul Getty Museum, the Getty Villa LOS ANGELES—Buried by the eruption of Vesuvius in A.D. 79, an over-life-size bronze portrait of Tiberius (ruled A.D. 14–37) was discovered in 1741, during the first years of excavation at Herculaneum. 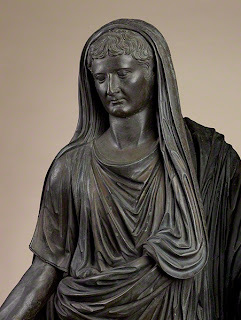 On loan from the Museo Archeologico Nazionale in Naples, this statue is the subject of the exhibition Tiberius: Portrait of an Emperor, on view at the Getty Villa October 16, 2013 through March 3, 2014. Brought to the Getty Villa for conservation and analysis last October, the sculpture provides an opportunity to re-examine the career and character of Rome’s second emperor. The exhibition has been co-organized by the J. Paul Getty Museum and the Museo Archeologico Nazionale in Naples. Standing over eight feet tall, the statue had been off view for decades on account of structural weaknesses in its lower sections and base. Putting this grand imperial portrait back in the public eye was, therefore, the primary goal of the collaboration. In order to do so, Getty conservators developed a new internal support that evenly distributes the substantial weight of the figure—some 1,050 pounds of bronze—and ensures its secure and safe display. The statue has also now been fully cleaned, revealing the lustrous dark patina it would have had when first showcased in the Royal Museum at Portici. This portrait and other works of art were heavily damaged by volcanic debris that inundated Herculaneum. Because it was standard practice in the eighteenth-century to restore sculptures to appear complete and virtually unblemished, the Getty’s investigation of the figure revealed much about the techniques used in these early restorations, such as the pouring of molten bronze to fill missing areas, a series of bolts to secure the additions in place, and the applied patina, which would have hidden any trace of the restorers’ masterful intervention. The opportunity to study the portrait in detail has also shed light on how it was manufactured in antiquity. 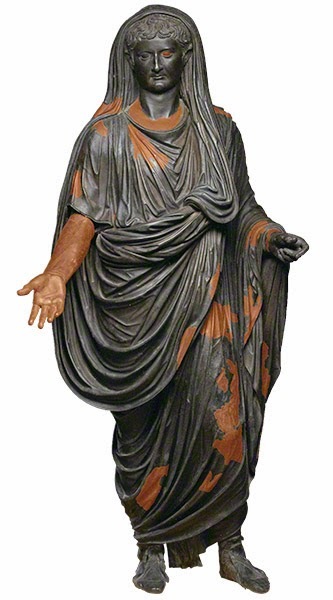 As was typical for large-scale bronze statuary, the Tiberius was fashioned using the lost-wax casting technique. Casting and assembly, however, were unusually complex, involving some sixty individual pieces to create the numerous folds of the emperor’s toga and tunic. Next year marks the two thousandth anniversary of Tiberius’s accession as Emperor and a timely opportunity to display the newly conserved portrait and re-examine his career and character. Overshadowed by his predecessor, Augustus, Tiberius has long been thought of as an isolated and rather unpleasant character. Achieving power through twists of fate and familial circumstance, he was often uncomfortable in the role of ruler, and ultimately fled from Rome to the island of Capri and his magnificent Villa Jovis. There, his depravities—at least according to his detractors—reached their peak. Pliny the Elder (A.D. 23 or 24–79) called him “the gloomiest of men,” while Suetonius (about A.D. 70–130) relates that he was so disliked that, when he died, Rome resounded with a cry of “To the Tiber with Tiberius.” Yet many scandalous reports—still influential to this day—were written well after Tiberius’s death, and much of what they tell is little more than unsubstantiated rumor. This exhibition proposes a more balanced view of this complicated ruler—both his virtues and his failings—and the political and domestic power struggles that framed his life. Tiberius: Portrait of an Emperor was organized by the J. Paul Getty Museum and the Soprintendenza Speciale per i Beni Archeologici di Napoli e Pompei—Museo Archeologico Nazionale di Napoli, Laboratorio di Conservazione e Restauro. It celebrates 2013 as the Year of Italian Culture in the United States, an initiative of the Italian Ministry of Foreign Affairs, realized under the leadership of the President of the Republic of Italy. The exhibition was cocurated by David Saunders, assistant curator of antiquities, and Erik Risser, associate conservator of antiquities at the J. Paul Getty Museum. The J. Paul Getty Trust is an international cultural and philanthropic institution devoted to the visual arts that includes the J. Paul Getty Museum, the Getty Research Institute, the Getty Conservation Institute, and the Getty Foundation. The J. Paul Getty Trust and Getty programs serve a varied audience from two locations: the Getty Center in Los Angeles and the Getty Villa in Malibu. The J. Paul Getty Museum collects in seven distinct areas, including Greek and Roman antiquities, European paintings, drawings, manuscripts, sculpture and decorative arts, and photographs gathered internationally. The Museum's mission is to make the collection meaningful and attractive to a broad audience by presenting and interpreting the works of art through educational programs, special exhibitions, publications, conservation, and research. The Getty Villa is open Wednesday through Monday, 10 a.m. to 5 p.m., with special Saturday hours until 9 p.m. October 12–November 30, 2013. It is closed Tuesday and major holidays. Admission to the Getty Villa is always free. A ticket is required for admission. Tickets can be ordered in advance, or on the day of your visit, at www.getty.edu/visit or at (310) 440-7300. Parking is $15 per car. Groups of 15 or more must make reservations by phone. For more information, call (310) 440-7300 (English or Spanish); (310) 440-7305 (TTY line for the deaf or hearing impaired). The Getty Villa is at 17985 Pacific Coast Highway, Pacific Palisades, California.